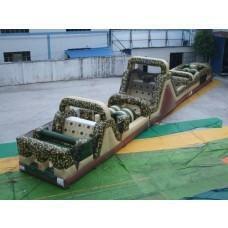 The Camouflage Mega Obstacle Course is a combination of 3 of our popular obstacle courses put together as one. This inflatable is fun for kids and adults, offering hours of active fun. It will make your next competition, party, or field day an event to remember. The course features a series of challenging physical obstacle an individual or team must navigate usually while being timed. It includes running, climbing, jumping, crawling and sliding.